It's time to uplift your wardrobe with unforgettable summer shapes. This season, a rich palette of yellow, crisp white and chambray denim await you. After all, tis the season for long days in the sun, where simplicity meets style. Lavender steals-scenes from am to pm. Dial up or tone down this chic shade with dresses and easy seperates. Accessories are stunningly crafted - be that straw basket bags, woven slides or tassel earrings - all of which designed to spend the summer with you. RSVP now and make a stylish entrance in these memorable statement pieces. Lavendar and yellow floral prints are having a (big) moment right now, showing up in midi dresses and separates alike. Crisp white styles in sleek and simple fabrications and streamlined shapes nod to this refined trend. Accessories reinforce the excitement of the season - with upscale glamour their calling card. Think apple red, pink fizz, lilac, ,navy, white and denim! Then take it up a notch with easy-to-wear fabrications like gingham and washed linen for Girls and crisp cotton voile and cotton chambray for Baby Girls. This month's range is exactly what happens when kids enter candy stores. Fun! Play! Deliciousness! Top up all your summer essentials with cute cuts and a perfectly-sweet palette. Stripes, florals and fruit embroideries found here is the stuff of long summer days. For Baby Girls, it's all frill sleeves, rompers and pretty details. Ric-rac and pompoms complete this very pretty picture. Every style this season has been designed with one thing in mind: long summer hangs! A fresh palette of pastel blue hues, peachy pinks with plenty of denim reinvigorate today's teen, prepping her for a very festive decking of the halls. Linen blend fabrics and ginghams add a retro quality to the range. And whatever you do, don't miss the dresses in denim and off-shoulder details! This season's guy is all smiles in printed tees and shorts. 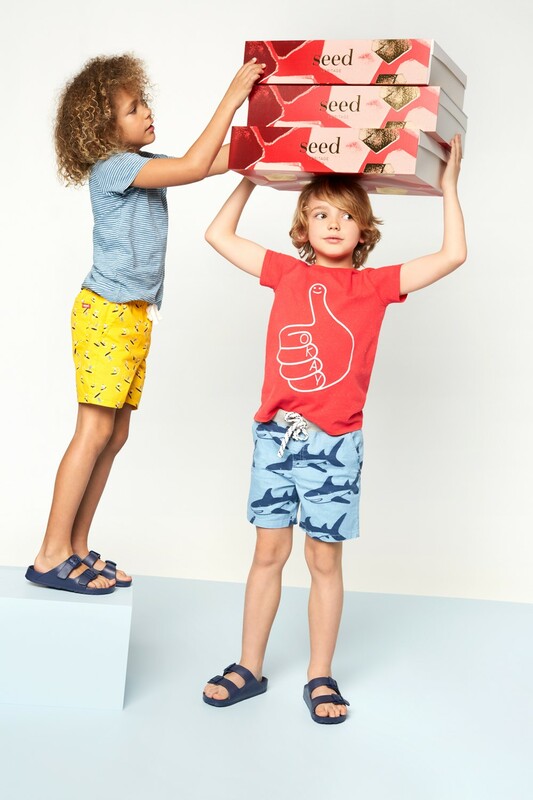 If it's not graphic smiley-faces and thumbs-up signs it's seaside motifs with a hint of nautica. The palette is all sunshine yellows, reds and cornflower blues. Classic navy and white is thrown in for good measure. The 'ones to watch' definately include the shark cap and backpack. For Baby boys, overalls - whether in red and white pinstripe or complete with sunny patch or dinosaurs - ensure the festive fun is only a candy cane away. Overall, tees and shorts - in fun prints and upbeat colours bring the personality. And then some. Keep today's newborn cool in peek-a-boo pieces, featuring whimsical illustrations and precious prints. Bunny rompers, animal face bodysuits, rompers in cherries or stripes and scrumptious towelling suits and separates are all perfectly good reasons to celebrate baby's first Christmas.